YOU KNOW THAT FEELING WHEN YOUR SKIN TINGLES FROM HEARING A CERTAIN SONG? 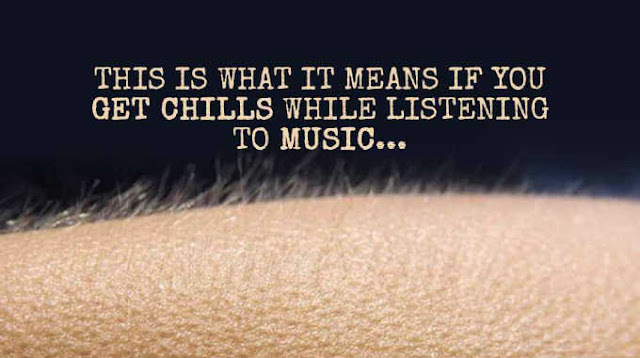 WELL IT TURNS OUT THAT GETTING CHILLS FROM MUSIC HOLDS A SIGNIFICANT MEANING. I know you’ve had it happen to you- a certain song comes on the radio, or you hear someone sing in just the right way, and a shiver goes down your spine. Goosebumps and chills are byproducts of something extra special- but what is it? Well first, let’s start with what we can call this anomaly. Frisson. Mitchell Colver wrote about this fascinating bit of science on The Conversation. “WE PREDICTED THAT IF A PERSON WERE MORE COGNITIVELY IMMERSED IN A PIECE OF MUSIC, THEN HE OR SHE MIGHT BE MORE LIKELY TO EXPERIENCE FRISSON AS A RESULT OF PAYING CLOSER ATTENTION TO THE STIMULI,” COLVER WROTE. Essentially, the researchers wanted to find out if certain personality types were more easily triggered to a frisson response than others. To test this, they had participants wired up to a machine that measured how their skin responded to various pieces of music. The artists included Air Supply, Hans Zimmer, Chopin and a few others. According to the researchers, these songs were chosen because they contained at least one thrilling or climatic moment that would likely cause frisson. “Studies have shown that people who possess this trait have unusually active imaginations, appreciate beauty and nature, seek out new experiences, often reflect deeply on their feelings, and love variety in life,” wrote Colver. What’s more, is that Colver discovered it’s not solely the emotional side of this personality trait that causes a reaction to music- it’s the cognitive. For example, using your mind to imagine how a song will play out, or creating mental imagery during a song. It’s also a combination of these things and being pleasantly surprised when our expectations are exceeded. TO PUT IT SIMPLY: PEOPLE WHO COMPLETELY IMMERSE THEMSELVES IN MUSIC ON AN INTELLECTUAL LEVEL- THOSE WHO DO MUCH MORE THAN MERELY ‘HEAR’ IT- ARE MORE LIKELY TO EXPERIENCE THE SENSATION OF FRISSON. What song have you heard that has caused you to experience frisson?